From career-igniting releases to mighty moments from some of D&Bs biggest names, Programs dedication to forward thinking D&B goes from strength to strength. Over the past seven releases, the label have acted as a solid platform for exciting new drum & bass prospects such as Frankee, Chroma, LoKo and Nitri as well as bolster the repertoires of longer-standing scene preachers Wickaman, Hoodlum, Mavrik, Bladerunner, RV and Paul B. Now peering over the edge of their second year, the label is re-engaging with some of the acts they broke last summer for some equally impressive follow-up releases. Kove is the first to return to the label. A talented tattooed tearaway with a taste for both the blazing beats and the deeper side of the dance, both cuts on his Program debut - 'Iodine' and 'Open Ground' - became instant 2012 dancefloor standards, championed by key players across the board. 'Gone' continues his promising audio armoury with distinct maturity. Breathy and breezy, its stunning depths become apparent from the very first fluttering pad. Coated in a beautifully underplayed vocal hook, 'Gone' rolls with blistered bass grace as staccato kicks and snares puncture the otherwise dreamy ambience And the groove masterfully develops with timeless dancefloor dynamics. Rolling but never quite rampaging, it represents everything that you fell in love with drum & bass in the first place: subtleties, sophistication and just a slight sense of pensive menace. 'Airlock' follows. Allowing the vocal to play more of a dominant role in the mix, its Kove at his most yearning and poignant. Opening with a blast of minor key euphoria, the skippy, snappy breakbeats take complete control of the groove, bowing a big nod to drum & basss most formative period. Stark and solid, warm and rolling, as Airlock develops were treated a fine balance of cruising synth washes and laidback guitar licks as the vocal whistles deep in the well-textured mix. If youre looking to hypnotise your floor any time soon then look no further This will have your crowd locked in tighter than a state penitentiary. 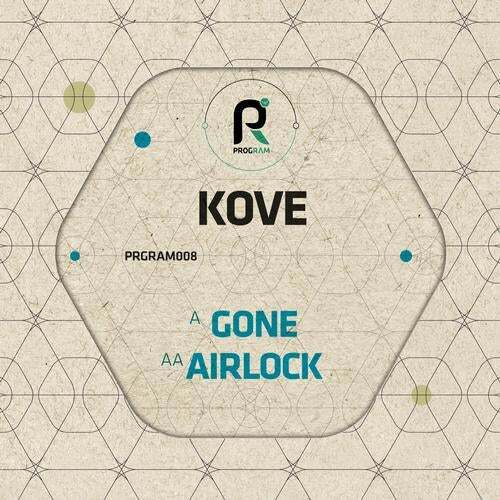 Finally, as a generous digital exclusive, Program have squeezed a second version of 'Gone' from Kove. The special '6AM mix' takes off from the spine-shuddered mess the original left us in And it does so with a heavier, classically trained breakbeat, fuller bodied bassline and languishing rim-shot soaked ending. Perfect for a late-night reboot or end-of-party hug-inducer, were anticipated some serious heavy rotation as the warmer months ease in. Once again, its time to get with the Program!